Aux Ptit Soins wins the Coral Cup! Britain's champion jump trainer Paul Nicholls won with a horse he had not run before. Aux Ptits Soins had competed three times in France, and won twice, following which Nicholls and owner John Hales decided he should be bought. That decision was thoroughly vindicated when the five-year-old clung on for victory under Sam Twiston-Davies, winning by a neck and a neck from Zabana and Activial, with Taglietelle in fourth. Reflecting on the horse's unusual pre-Festival campaign, Nicholls, who had not won The Coral Cup before, said: "He's clearly very good, but I thought maybe we would have to wait until next year to see what he could do. "We were going to run him in the National Spirit Hurdle [last month] at Fontwell, but the ground was bad, and since John loves a runner at this meeting we decided to wait. I felt he had enough experience from racing in France, although he nearly fell at the second and if he had done I'd have been kicking myself from here to Bristol and back. He was either brilliant at his hurdles or novice. "I had no idea how well handicapped he was, because he'd won two novices' hurdles at Auteuil and had worked really well, but that doesn't tell you anything - it's what happens on the track that counts. Many times I've had good French horses in my hands that come with a lot of hype but which let you down because they are not good enough. "I'm learning about this one and did say he might win, but I just didn't know. I went with John to see the horse run in France the final time, but the night before we saw him and I said 'Let's have him' because he was really gorgeous. John loves chasing so I would think that's the plan for next season - whether he has another hurdles run I'm not sure. "When he gets his act together he could be really smart, and Nick Scholfield [second jockey to Twiston-Davies at Nicholls' yard] said this was the best horse he had sat on." Jockey Sam Twiston-Davies and Aux Ptits Soins pulled off an ante post gamble after the Paul Nicholls-trained five-year-old held on narrowly to record a neck victory. The 9/1 shot had been talked up as one of the handicap 'good things' at The Festival this week but he had to dig deep to repel the challenge of runner-up Zabana with 17/2 favourite Activial a further neck back in third. "He wasn't pretty at a few but he travelled very, very effortlessly down the hill and he stayed on well when he hit the rising ground," said Twiston-Davies. "He jumped nicely when he needed to but just fluffed a couple of hurdles. He's a bit of a novice as he's only had the three runs and now he's running in a big handicap hurdle. "What's nice though is when I asked him to go forward, he ran on and hit the line very well. I think he's very smart. "We see him as a future chaser. Obviously, he's got to brush up on his jumping but that is something we can improve on in time. He would never have gone that fast in his life so it's nice to see him pick up like that. "Paul has been talking him up on a few of these preview panels so I thought 'I better not mess up on this one' but it was a great performance. We were lucky we got a good start so could get a nice position where he could have a bit of space and he's matured as the race went on. "It's nice to get a winner on the board and hopefully I can relax now and enjoy myself. When you've had a winner, you relax and let the races unfold rather than make things happen. I hope I get another now!" County Meath handler Andrew Lynch just missed out on a Festival success with his first runner at Cheltenham when front-running Zabana was pipped on the line. Zabana, a 25/1 chance, lost out by a neck to Aux Ptits Soins and Lynch hopes the six-year-old has a bright future. "I hope to be back here next year with him as a chaser," said Lynch, who trains just six horses at his Dunsany base. "We'll probably skip the festivals back home in Ireland as he's still an unfurnished horse. "He made a mistake at the third last which probably cost him a bit but I'm delighted with that run from my first runner here. I know he was 25/1 and I was probably the only one that believed in him beforehand." Robbie Colgan, who partnered the runner-up, added: "He's just been run out of it, I just missed the third last which was unfortunate. He jumped the last well and came up the hill nicely. I'm really happy with the run but just a bit sick that he's just got beaten." 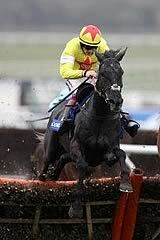 Noel Fehily said of third-placed Activial: "He ran a blinder but he was probably caught for toe coming down the hill. He then flew up the hill again." 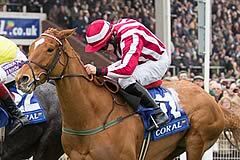 Paul Carberry, aboard fourth-placed Taglietelle, commented: "He ran very well. At the second last he was a bit slow and I should have put him into it but he's ran well."